Dr. Jefferson with her dog, Cosette. Dr. Eileen Jefferson graduated from Cornell University with a degree in Biological Sciences in 2003, and received her DVM with honors from the University of Illinois College of Veterinary Medicine in 2008. 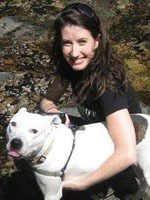 A former staff veterinarian at the San Francisco SPCA, she now operates her own animal advocacy-based mobile practice, Ethical Veterinary, in Ulster County, N.Y.
Dr. Jefferson regularly assists The Humane Society of the United States in New York State with its animal advocacy campaigns and rescue operations in the field. She also helps lead and organize the growing humane veterinarian lobby in the state. 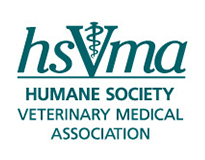 While in veterinary school, Dr. Jefferson won multiple awards for her persuasive writing on animal issues, and served as an associate editor for the Student AVMA Journal. She now writes her own blog, Ethical Veterinary, in addition to op-eds that further humane causes. When not tending devotedly to her patients and her own animals, Dr. Jefferson is consumed by classic literature and writing.